A magnetic filament of solar material erupted on the sun in late September, breaking the quiet conditions. Image acquired Sept. 29-30, 2013 by the Solar Dynamics Observatory. NASA officials dubbed the solar view a 'canyon of fire' on the sun. 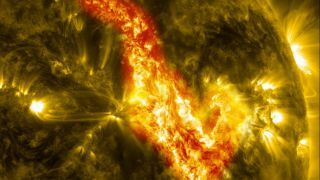 When a 200,000-mile (320,000-kilometer) filament of solar material tore through the sun last month, it cut what looks like a "canyon of fire" in our closest star, new NASA observations show. Researchers at the Goddard Space Flight Center in Greenbelt, Md., pieced together a video of the sun's fire "canyon" of the phenomenon based on images collected on Sept. 29 and 30 by the space agency's sun-watching Solar Dynamics Observatory. The sun is mainly comprised of plasma, which is a soup of charged particles that forms when gas atoms get so hot that their electrons detach. The movement of these charged particles creates intense magnetic fields, which give rise to the wispy loops and violent eruptions on the sun's surface. NASA officials say the canyon-like feature in the new images show a channel where magnetic fields held a filament of plasma aloft before exploding. The $850 million Solar Dynamics Observatory spacecraft, which launched in February 2010, keeps a watchful gaze on the sun's surface from a geosynchronous orbit around Earth. It's equipped to make observations in a variety of wavelengths to help capture different aspects of the sun's corona, or outer atmosphere. In the video, the red parts of the sun represent plasma heated to temperatures of 90,000 degrees Fahrenheit (about 50,000 degrees Celsius), which NASA officials say is a good range for observing filaments as they form and erupt. The yellow patches show solar material flowing through the sun's magnetic field lines at 1 million degrees F (about 555,000 degrees C). Much of the canyon in the video appears browner, indicating temperatures of about 1.8 million degrees F (about 1 million degrees C). "By comparing this with the other colors, one sees that the two swirling ribbons moving farther away from each other are, in fact, the footprints of the giant magnetic field loops, which are growing and expanding as the filament pulls them upward," NASA officials wrote in a video description.